A new hospice has opened thanks to a £21 million appeal backed by a regional daily. The Glasgow Evening Times has spent the past six years supporting the construction of the new Prince and Princess of Wales Hospice in the city. The new building, in Glasgow’s Bellahouston Park, has been built with facilities which will allow it to follow a Scandinavian model of care known as ‘Sengetun’. 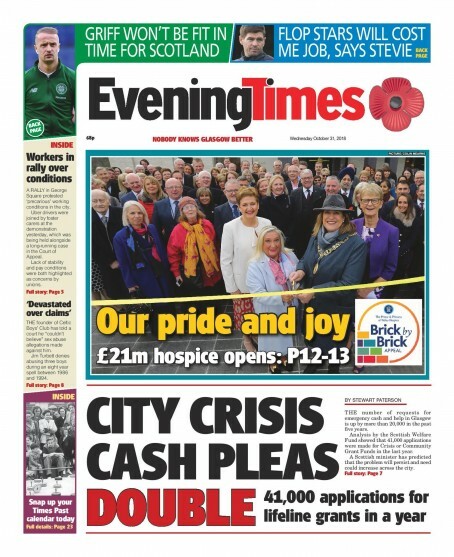 The hospice’s opening featured on the front page of the Evening Times on Wednesday. Deputy editor Henry Ainslie told HTFP: “When we first announced our backing for the ambitious Brick by Brick Appeal back in 2012, we knew it would be a huge task. We also knew our readers would be up to it. “The Evening Times has a strong campaigning history, whether it is fighting against injustice for the people of Glasgow, bringing communities together or fundraising for much-needed institutions and resources. “The Prince and Princess of Wales Hospice is a fantastic place, and it means a great deal to many of our readers. We have backed the Brick by Brick appeal every step of the way and we were delighted to announce the total had been reached earlier this year. great stuff.well done. good community journalism.